Finally, after the news, here is the video of the young Polish athlete’s undertaking. 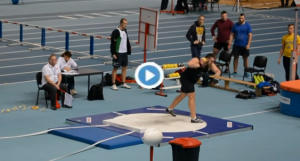 To refresh your memory: Bukowiecki established, a few days ago, the new U20 World Record of indoor shot-put, thanks to the extraordinary mark of 22,48m, increasing by 10 cm the 22.38 mark which he shot the 24th of January 2015. So, enjoy the lunar shot by this great white hope of the young Track&Field; he seems well-projected towards a bright future among the seniors.